A system is defined as “an organised, purposeful structure that consists of interrelated and interdependent elements (components). These elements continually influence one another (directly or indirectly) to maintain their activity and the existence of the system, in order to achieve the goal of the system” (Business Dictionary, 2015). The Oxford dictionary defines an ecosystem as a complex network or interconnected system. As an element of a start-up system, funding is interrelated, interdependent and influenced by the other elements of that system. Therefore it is pragmatic to consider funding in the context of its start-up ecosystem. 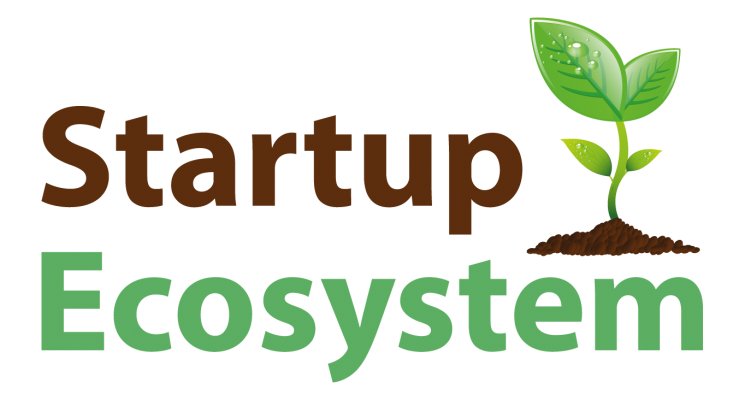 The elements of a start-up ecosystem include people, start-ups at all stages of development and multiple types of organisations interacting as a system to create new start-up systems. The organisations include universities, research organisations, service providers such as legal and finance, large corporations, support organisations including incubators, accelerators and co-working space and funding organisations including angel investors, venture capital companies, crowdfunding portals, loans, grants etc. Each organisation is designed to focus on specific parts of the ecosystem function determined by the start-up development stage (Grow Advisors, 2015). Skills, time and money are components used in the interactive network of people within the start-up ecosystem. As with any system, a start-up ecosystem is influenced by internal and external factors. An external factor such as the global economic crisis of 2008 can have a disruptive on the dynamics of the ecosystem. Internal factors are the people and organisations within the ecosystem and their contribution. The global economy maybe reaching a tipping point in the transition between the Industrial Era and the Information Era. Considering the significant portion of job and economic growth in the last 15 years coming from high-growth technology companies such as Google, Amazon, Facebook, Groupon and Twitter technology entrepreneurship and technology start-ups will be the primary growth engine of the Information Era. For that reason, nurturing a start-up ecosystem on a local and global scale can keep the world on a path to greater prosperity (Compass.co, 2015). The Irish government has committed to be being a facilitator in the development of a start-up ecosystem in Ireland recognising the importance of entrepreneurship and start-ups in the nation’s economic growth and development. In its National Policy statement on Entrepreneurship in Ireland the government, as part of the Action Plan for Jobs 2014, placed a strong emphasis on entrepreneurship with an ambition to be the most entrepreneurial nations in the world with a world-class environment to start and grow a business (Department of Jobs, Enterprise, and Innovation, 2014). The five year forecast is to double the jobs impact on the Irish economy with the objectives set to (1) increase the number of start-ups by 25%, (2) increase survival rate in the first 5 years by 25% and (3) improve the capacity of start-ups to grow by 25%. The minister for Jobs, Enterprise and Innovation, Richard Bruton describes the plan as “a challenging but realistic ambition”. 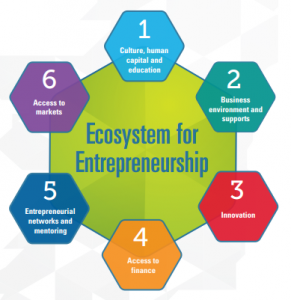 Through the collaborative work of the Entrepreneurship Forum with direct contact with academics and entrepreneurs the ‘Ecosystem of Entrepreneurship’ was set as a model for the Irish start-up ecosystem. The six key elements that make up the ecosystem are illustrated below. Access to finance is one of the fundamental elements of this system. To this end, the government has committed to expand the range of access to finance instruments to meet the ambition as a start-up hub, attract more angel and international venture capital investors and to ensure banks develop skills to meet needs of start-ups and early stage entrepreneurs (Department of Jobs, Enterprise, and Innovation, 2014). Funding is a pivotal element of the Irish start-up ecosystem; an element which is interdependent, interrelated and continuously influenced by other elements of the ecosystem. Therefore, it would be unwise to focus on funding as an issue in isolation. Rather a holistic approach is required so as to management and develop a start-up ecosystem ensuring that all elements i.e. organisations work together locally and nationally with a common understanding to attain the shared goals as set out in the National Policy Statement on Entrepreneurship in Ireland. If technology entrepreneurship is the primary growth engine of this Information Era then fostering a vibrant start-up ecosystem is fundamental in Ireland’s path to prosperity. At a time when the nation is suffering a hangover from the loss of the web summit it is hoped that this “challenging but realistic ambition” will bear fruit by 2020. On the cusp of a general election, will this be another pre-election promise or the foundation for a bright new horizon for entrepreneurship in Ireland? – Only time will tell.